Games are just a small, but potentially very meaningful part of the new set-top box's overall appeal. By the time Apple began its event on Wednesday, we already knew most of the basics: leaks had soured the surprise of the iPhone 6s and 6s Plus, the iPad Pro, and certainly the long-awaited Apple TV refresh. However, one pre-show rumor didn’t come true, which left some people disappointed: The new set-top box isn’t a gaming powerhouse. It plays games, certainly. 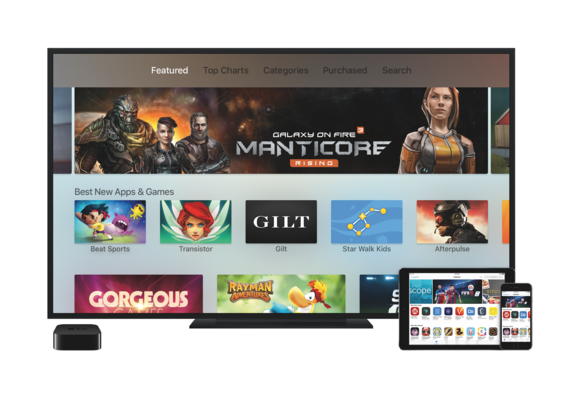 The addition of the App Store means that the new Apple TV is designed to run big-screen games, with Apple demoing a multiplayer version of Crossy Road, a new Rayman, and a rhythmic, family-oriented sports game from Rock Band maker Harmonix. And with the touchpad remote, iOS devices, gamepads, and other peripherals all supported, there’s some versatility to what developers can do with it. But the idea that the Apple TV could challenge the Xbox One or PlayStation 4 in any serious way seemed off-base, and Apple’s brief presentation didn’t inspire belief that gaming will be a tentpole focus for the device. Does that make it a “major bust,” as gaming site Kotaku said? Well, no: there’s still plenty of upside to the Apple TV’s gaming capabilities, even if rumors undercut the impact. One purchase or download can get you the same game across devices, plus cloud saves let you carry over progress between versions. The Apple TV is not a $350–$400 console packed with high-end gaming guts; it’s a tiny, $150 box with an iPhone 6 processor in it. 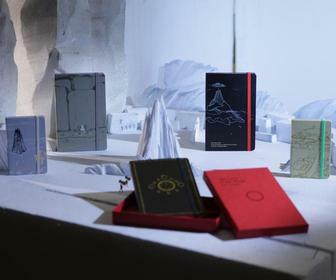 And it’s not designed to run the kinds of $60 games that are built by hundreds of people and showcase the latest in graphics technology. In fact, many of the games you’ll play probably started life on the iPhone, and most will be free-to-play offerings. In truth, the new Apple TV is quite similar in capabilities to a few other boxes on the market. Amazon’s Fire TV, for example, is all about media and games, while Android TV-powered boxes (like the Nexus Player) can likewise run apps, games, and more. Ouya is perhaps the most high-profile failure of the bunch, as it Kickstarted millions of dollars, built up a lot of hype, and then botched the landing. We probably needn’t worry about a messy launch with the Apple TV. There’s an incredible selection of iPhone and iPad games on the App Store that can be tweaked and revised for tvOS, and both the company and platform are a known quantity by now. Also, Apple sold more than 25 million of the boxes when it was just a “hobby” for the company—imagine what might happen now that Apple thinks it’s important. That said, the gaming capabilities of the Apple TV aren’t strong or central enough to be a big selling point. Apple realizes that, which is why games got a few minutes in the middle of the TV demo. It’s part of the overall appeal of the new box, but not the hook. But that’s the same deal with the iPhone and iPad—you buy these devices for apps, communication, media, and more, and you also happen to gain access to a vast array of great games along the way. In that sense, the Apple TV is the perfect complementary gaming device for an avid iPhone or iPad owner. The ability to buy or download a game on your touch device and also have it available on your TV (assuming the developer has made it Apple TV-compatible) is a wonderful perk, particularly with the ability to pick up a saved game on any device. And with iPhones and iPads used as secondary controllers for Apple TV, it makes the box that much more compelling. The top part of the Siri Remote is the touchpad, plus it has motion control capabilities built in, as well. But between the small touchpad and the lack of gaming-specific buttons, the Siri Remote isn’t going to work well for all types of games. In some cases, your iPhone or iPad might be an able substitute, although developers will have to contend with the fact that a (likely small) number of Apple TV owners won’t also have an iOS device. 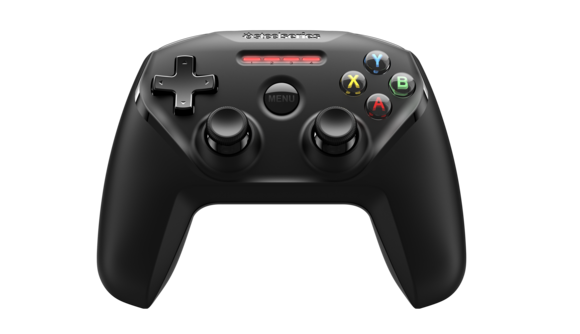 The SteelSeries Nimbus should launch alongside the Apple TV next month; with no Apple-made gamepad, it may be the only early option. Because there’s no traditional gamepad included with the box, advanced gaming will be limited to those who seek out additional peripherals. Apple isn’t even making its own controller for the TV; that’ll be left up to third-party makers through the MFi program. SteelSeries is first up with the Nimbus, which looks like a cheaper version of its Stratus XL iOS controller and also works with iPhones and iPads. There’s another limitation in play: It appears that apps and games are limited to 200MB of storage apiece. That may not be a problem for many casual games, but high-performance titles may need to turn to the cloud to house their data—or grab chunks as needed for progression. 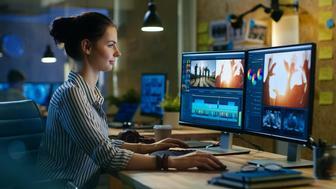 But it also means developers may need to condense or compress assets, which isn’t going to make games look any better on your 50-inch flat screen. Despite those potential complications, I see a lot of value to gaming on the Apple TV. It’s ideal for existing iOS device owners, and playing games on a box directly connected to your TV is a lot easier than using AirPlay streaming or one of those awkward HDMI connectors from years back. 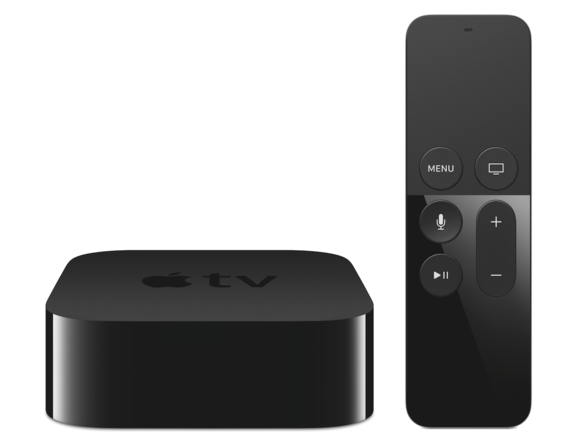 The Apple TV could be a great living room console for family and party multiplayer experiences, such as a trivia game like You Don’t Know Jack. Get a few friends with iOS devices, crowd them around the TV, and you’ve got easy, instant fun. The Siri Remote has a built-in microphone, so why not bust out some karaoke party games, for that matter? It’s also encouraging to see developers embracing the option to bring grander console experiences to Apple TV. You’ll be able to play this fall’s Guitar Hero Live on the device with the same plastic guitar peripheral—but no need for a dedicated gaming console. And popular toys-to-life games Skylanders Supercharged and Disney Infinity 3.0: Star Wars will both launch starter kits for Apple TV, as well. 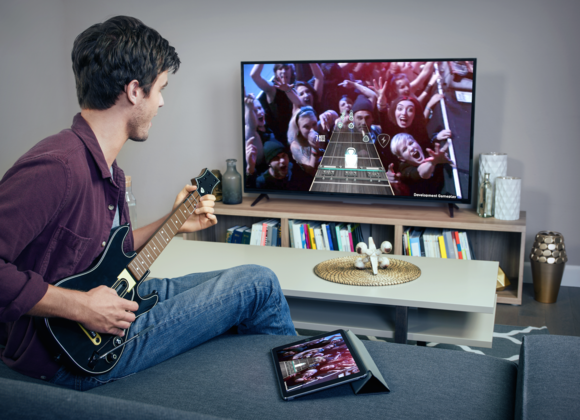 This photo shows AirPlay support from the iPad, but Guitar Hero Live will also be directly on Apple TV and use the same guitar controller. As far as smaller games go, I’m not sure that every game will thrive in the living room setting. I’d rather play Crossy Road on my phone and be right there in the tense tapping action, rather than several feet away from a TV. It reminds me of buying mobile gem Threes! on Xbox One last year—I’d played hours and hours on iPhone, so I plopped down $5 to grab the console version and only played for a few minutes total. It just didn’t click with me the same way. But bigger, deeper games will make a lot of sense on Apple TV. Apple featured Transistor prominently during the demo, and it’s one of the games that will really benefit from the grander experience of playing on a TV. Same with Bastion, XCOM: Enemy Within, The Walking Dead, and Star Wars: Knights of the Old Republic. While all work well on an iPad, those are the kinds of games I want to play on a big screen while slumped on the couch at the end of the day. And since Apple TV games can require a full gamepad (unlike iOS games with MFi controllers), the console experience can be re-created without compromise. And what about retro games that started on a controller before moving to touch? Sonic the Hedgehog will be a lot sweeter on your TV when you don’t have to dig out a dusty old Sega Genesis. No, the Apple TV probably won’t stop anyone from shelling out for an Xbox, nor will the option of television play likely kill your iPhone gaming habits. But the option for living room play within Apple’s mobile ecosystem is a huge perk of the new set-top box, and another reason why it seems like a seriously entertaining upgrade.